407 Beacon is located on the south side of Beacon, between Gloucester and Hereford, with 405 Beacon to the east and 409 Beacon to the west. 407 Beacon was designed by Snell and Gregerson, architects, and built ca. 1867, one of five contiguous houses (401-403-405-407-409 Beacon). 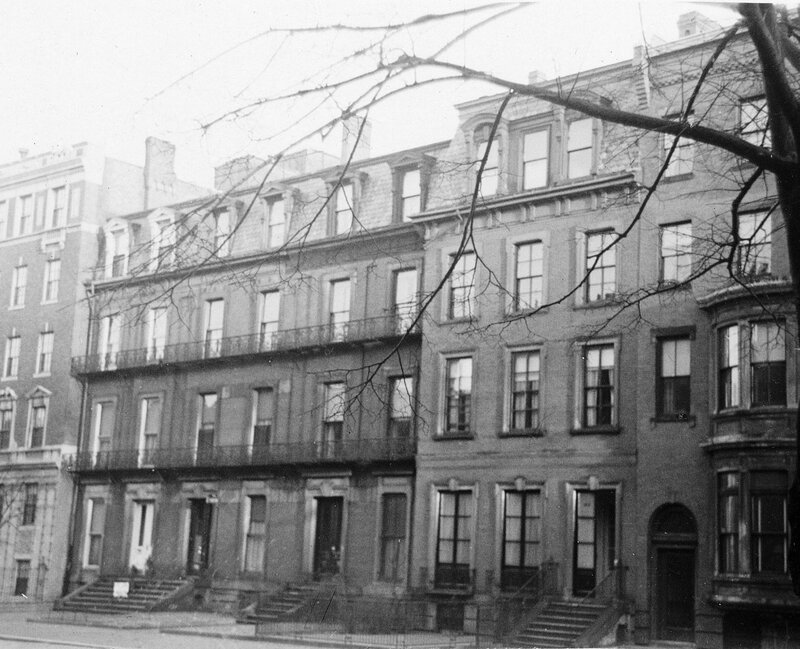 James Gregerson, whose firm designed the houses, lived at 403 Beacon. Click her for an index to the deeds for 407 Beacon. On July 18, 1868, 407 Beacon was purchased by Francis Skinner Fiske. He and his wife, Anne Farnsworth (Wilson) Fiske, made it their home. They previously had lived at 54 Chestnut. Francis Fiske had been a lawyer and state legislator in New Hampshire prior to the Civil War. He served as a Lt. Colonel in the Civil War, resigned in 1862, and in 1865 was brevetted a Brigadier General for his leadership at the Second Battle of Bull Run. After the war he was a broker in Boston until 1872, when he was named deputy clerk of the US District Court. From 1885 to 1906 he served as US Commissioner in Boston. 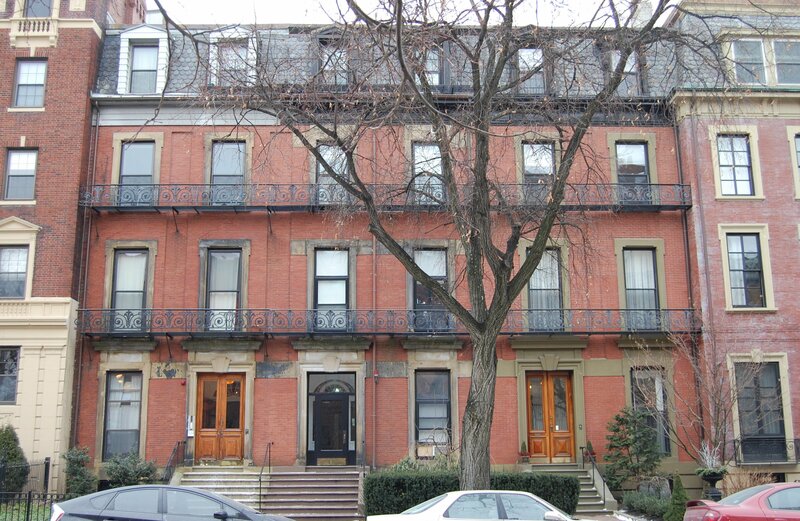 The Fiskes continued to live at 407 Beacon in 1870, but had moved to the Longwood district of Brookline by 1872. When he acquired 405 Beacon, Francis Fiske had entered into a mortgage with Mary Pratt, Robert M. Pratt’s aunt. On January 30, 1871, she foreclosed on the mortgage and took possession of the property. Three days earlier, Anne Fiske had transferred 405 Beacon to William Pratt, Robert M. Pratt’s brother, as trustee, in for the benefit of Mary Pratt. Mary Pratt lived at 85 Mt. Vernon and at Oakley in Watertown. She leased 407 Beacon to others. 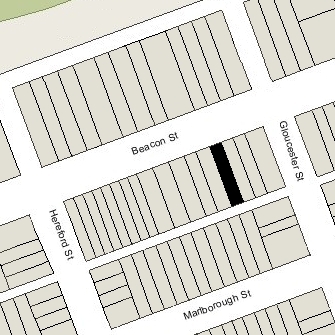 James Bush and his children continued to live at 407 Beacon in 1878, but had moved to Roxbury by 1880. He died in May of 1880. On July 18, 1878, 407 Beacon was acquired from Mary Pratt by Miss Annie Brooks Henshaw. Her brother, auctioneer and broker Francis Henshaw, a widower, and his children lived with her. They previously had lived next door, at 409 Beacon. His wife, Sarah (Nourse) Henshaw, had died in February of 1876. Francis Henshaw died in May of 1884. Annie Henshaw continued to live at 407 Beacon until her death in April of 1888. On October 1, 1888, 407 Beacon was acquired from the estate of Annie Henshaw by Lucy Hall (Bradlee) Stone, the wife of Frederic Stone. 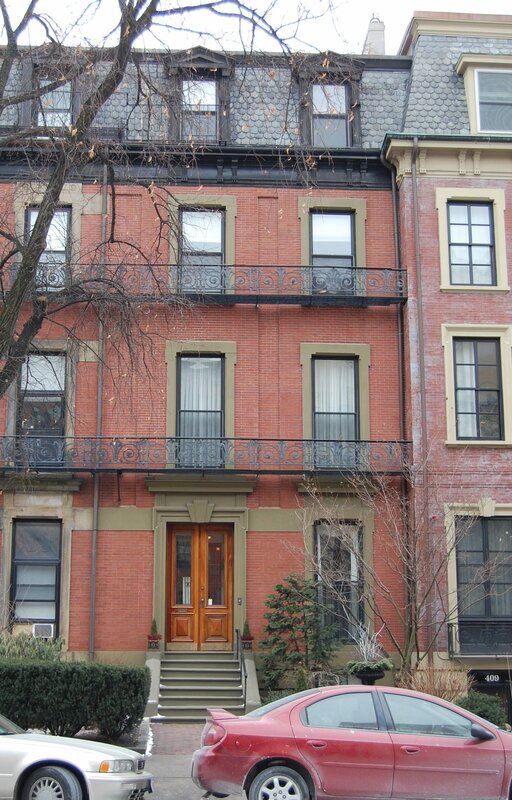 They previously had lived at 13 Commonwealth with Lucy Stone’s parents, Frederick Hall Bradlee and Lucretia (Wainwright) Bradlee. The Stones also maintained a home in Shrewsbury. Frederic Stone was a broker and shipping merchant in the China trade. Lucy Stone died in February of 1917 and Frederic Stone died in November of 1918. Their son, Philip Bradlee Stone, continued to live at 407 Beacon until his death in May of 1925. He was unmarried. On July 24, 1925, 407 Beacon was acquired from the estate of Philip Stone by Dr. Austin T. Brant. He and his wife, Edith Lille (Pattengill) Brant, made it their home. Dr. Brant was a physician specializing in obstetrics and gynecology, and maintained his medical offices at 407 Beacon. They previously had lived (and he had maintained his medical offices) at The Hotel Cambridge at 483 Beacon. Austin Brant died in December of 1933. Edith Brant continued to live at 407 Beacon until about 1969. On May 29, 1969, 407 Beacon was acquired from Edith Brant by Louise Robinson, trustee of the Louise Robinson Realty Trust. By 1970, 407 Beacon was the home of Mrs. Elsa Marilyn (Modano) Kelly, the former wife of Paul J. Kelly. On August 16, 1974, the Winter Hill Federal Savings and Loan Association foreclosed on its mortgage to Louise Robinson and sold 407 Beacon to John J. Murphy. It remained Elsa Kelly’s home and in the late 1970s, she married John Murphy’s brother, Patrick F. Murphy, a lawyer. After their marriage, they lived at 407 Beacon until about 1981. On August 31, 1983, Chester D. Clark and his wife, Ellen H. Clark, purchased 407 Beacon from John J. Pagani and L. Anne Hayman. It remained assessed as a single-family dwelling in 2015.